Funko stock is up more than 360% year to date. 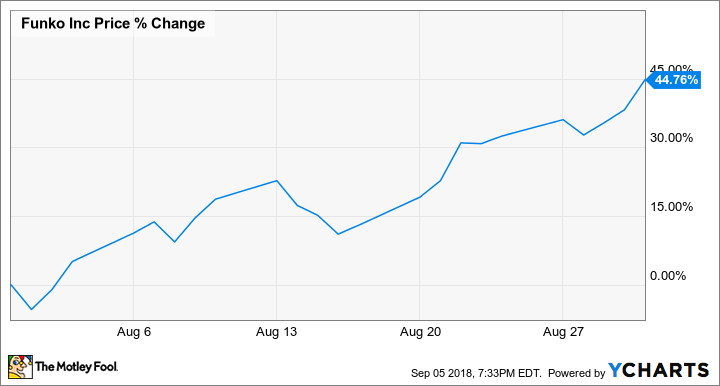 Funko, Inc. (NASDAQ:FNKO) stock climbed 44.8% in August, according to data provided by S&P Global Market Intelligence. Shares appear to have enjoyed continued momentum from two big licensing deals that the pop-culture merchandise company announced in July, and the stock continued to climb following its second-quarter earnings release. Funko published its second-quarter earnings on Aug. 9, posting sales and earnings that topped the market's expectations. Momentum has continued into September, with shares up roughly 20% in the month so far. Sales for Funko's June quarter climbed roughly 32% year over year to reach $138.7 million, soundly beating the average analyst estimate's call for sales of $122.5 million. Profitability for the period was also significantly better than anticipated, with adjusted earnings of $0.07 per share handily topping the average analyst estimate for per-share earnings of $0.02. The strong quarterly results came on the heels of the company's July announcements that it had secured licensing rights to make Pokemon toys and that it had partnered with Epic Games to produce toys based on the software company's hugely popular Fortnite. Funko's business looks poised for strong growth in the near term, but it's probably not a stock that investors without a high risk tolerance should pursue. While the company's motto that "everyone is a fan of something" rings true and pop culture merchandise appears to be on track for continued growth, it's far from certain that Funko's products will remain popular. If its iconic Pop! dolls (pictured above) and general aesthetic prove to be a fad and the company fails to come up with a hit new style, shareholders might quickly find that they are no longer fans of Funko stock.